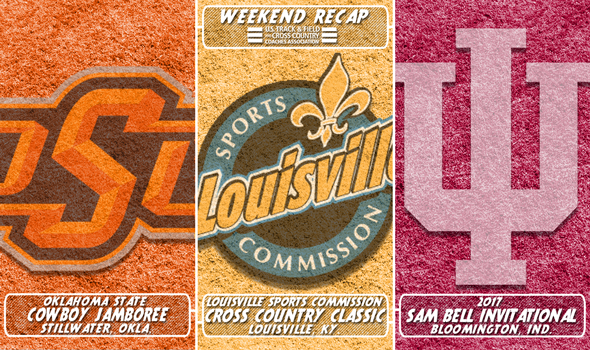 A busy weekend of NCAA Division I Cross Country continued on Saturday. Hordes of teams ranked in the top-30 of the most recent Men’s and Women’s National Coaches’ Polls competed in Louisville, Kentucky at the Louisville Sports Commission Cross Country Classic, while others tested their might in Bloomington, Indiana at the Sam Bell Invitational and in Stillwater, Oklahoma at the Cowboy Jamboree. This post will highlight some of the day’s big moments. Northern Arizona asserted itself in a big way on Saturday. The top-ranked Lumberjacks, who are the defending national champions, barely broke a sweat at the Louisville Sports Commission Cross Country Classic at E.P. “Tom” Sawyer Park – site of the 2017 NCAA Division I Cross Country Championships in November. NAU put six runners in the top-10 and scored just 19 points in a resounding victory. Matthew Baxter earned the individual win for the Lumberjacks as he covered the 8K tract in 23:10.52 and he was followed by three teammates: Tyler Day (second, 23:11.25), Andy Trouard (third, 23:27.89) and Geordie Beamish (fourth, 23:34.92). Luis Grijalva (ninth, 23:42.19) rounded out the scoring lineup for NAU. The Lumberjacks beat six other ranked teams in the process. No. 12 Furman finished second with 74 points, No. 24 Virginia Tech took third, No. 26 Boise State was fourth, No. 19 Illinois was fifth, No. 20 Middle Tennessee State was sixth and No. 7 Wisconsin fell to eighth without the services of senior standout Morgan McDonald. This was an important effort from NAU as it saw what BYU did Friday at the Bill Dellinger Invitational when it nearly swept the loaded meet. Welcome back to cross country, Allie Ostrander. After an injury forced Ostrander to redshirt the 2016 season, Ostrander opened the 2017 campaign in style on Saturday. Ostrander won the individual title going away as she crossed the finish line in 16:28.15, eight seconds ahead of Eastern Kentucky’s Charlotte Imer. Thanks to Ostrander’s low stick, the 13th-ranked Broncos eventually won the team title with 74 points as they held off No. 18 Wisconsin (101 points) and No. 29 Furman (121 points). Furman’s Allie Buchalski finished third overall in 16:42.19 and was followed by Northern Arizona’s Paige Gilchrist (fourth, 16:46.39) and Kentucky’s Katy Kunc (fifth, 16:46.30). No. 4 Michigan notched a win over fellow top-15 program Indiana at the Sam Bell Invitational. The Wolverines toppled the host Hoosiers by a score of 37-47. Michigan’s runners finished 2-6-8-9-12 and offset an individual win by Indiana’s Katherine Receveur. The 14th-ranked Hoosiers only put three runners in the top-10 compared to the Wolverines’ four. The ninth-ranked men of Oklahoma State and the 16th-ranked women of Ole Miss won team titles at the Cowboy Jamboree. The host Cowboys received the individual win from Sylvester Barus and beat the 25th-ranked men of Ole Miss, among others. The Lady Rebels held off a strong challenge by t-No. 9 Penn State and nabbed a signature victory. Defending NCAA XC individual champ Karissa Schweizer of Missouri earned the low stick in the women’s race.